Bring an element of style into your home by coming to our flooring store for discount area rugs. Adding warmth to your living area and protecting your floors, an area rug is the perfect choice for property owners that appreciate form as well as function. From Oriental rugs and braided rugs to hand-woven rugs from India, we carry all types of the rugs in our flooring showroom that cater to your preferences and price ranges. Decorating your home or business is easy and affordable when you depend on us for discount area rugs. If wall-to-wall carpeting is not what you want, you can achieve the same beautiful results with area rugs. These flooring products are very versatile. Mix and match them to achieve the look you want in your living space. 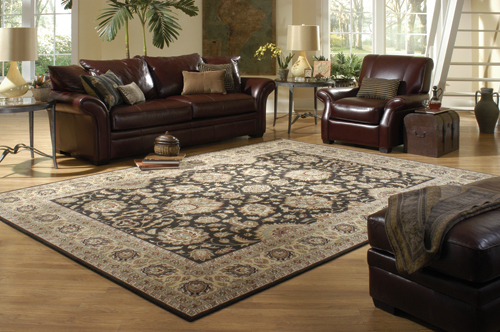 At the same time, because we offer wholesale rugs, you don’t need to spend a fortune redecorating your floors. Are you tired of your bland room? Change the ambiance by changing your floors. Just as painting your walls can brighter your living space, so can an area rug. They can hide defects in your floor or even accent its appeal, depending on how you use your new area rug. In addition, since area rugs come in all styles and colors, they can easily match your existing décor. At the same time, if you’re ready for a change, why not roll out a new area rug and revamp your entire room? All of this can be done for an affordable price. Because we are a flooring warehouse with access to many other stores in our network, we can always find the right rug at the right price for you. Contact us to find out more about the Ultimate Confidence Guarantee on our products. We proudly serve customers in Little Rock, Arkansas, and the surrounding areas.